Design and budget are very important; so is keeping community involved, says local firm. The design competition phase of a project to replace the iconic Sixth Street Bridge — which links Boyle Heights to downtown Los Angeles and is considered the city’s bridge “most at-risk” to collapse in a major earthquake—is fast approaching its conclusion. The city could as early as next month choose one of three architectural firm finalists who earlier this month presented their design concepts during a series of public forums to build the new bridge. The 80-year-old bridge has been featured in numerous movies and is one of several historic bridges spanning the Los Angeles River. At over 3,500 feet in length, it is the city’s longest bridge, and is considered one of the city’s most important engineering landmarks. By the end of 2012, a bridge design firm will be selected by the city and the final design will be completed in summer of 2014. Demolition and construction could begin in early 2015, with completion expected in late 2018, according to the project website. All three of the final contenders’ design plans envision a bridge that is more than a transportation crossing, but rather a people-centered destination that incorporates pedestrian walkways, bike paths, plazas and public spaces ripe for entertainment and recreation. The designs are expansive, grandiose even. Only one of the three firms is based in Los Angeles, which an AECOM representative last week told EGP gives them a deeper understanding of the community’s needs, both in terms of its design and the impact construction will have on those communities. “We know L.A.,” Senior Vice President Andres Ocon, P.E., told EGP. The company told EGP it is working hard to communicate with the community and to identify all stakeholders. AECOM’s focus on public input and mitigation of potential issues arising from the building process was a departure from the other two firms, which based most of their presentations on their design elements. AECOM presenters were also sure to emphasize enhancements that they said would benefit smaller pockets of the community, such as Pico Aliso, and to include how the design could accommodate popular local events such as Dia de Los Muertos. That’s not to say AECOM’s presentation on its “guardian angel” inspired bridge, designed by Yee Associates, lacked detail of its design features. The firm has built 40 iconic bridges all over the world including the Sutong Bridge in China, Puente De La Unidad in Mexico, Ponte Vasco de Gama Bridge in Portugal, and others in the US. AECOM also has experience in Los Angeles; they worked on the Cesar Chavez Bridge Seismic Retrofit, among other projects. Ron Yee specializes in designs that are unique to an environment, according to AECOM, who told EGP that the design also takes into consideration things beyond their control such as existing transmission lines. The design also takes into consideration future developments envisioned for the Los Angeles River, they told EGP. It includes environmentally friendly green elements, such as solar lighting embedded into walkways. Lighting is strategically used to create a safer environment, a very important consideration in the densely populated area, he said. Yee’s angel concept, according to AECOM, enables an open skyline and belvederes located near the pillars will give sightseers the opportunity to take in the views. She points out that this is not a redevelopment project but a public improvement project that has the potential to be a catalyst for the community. The bridge is also pedestrian and cyclist friendly. 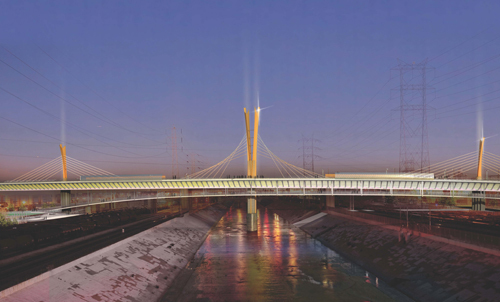 The upper and bottom part of the bridge will have pedestrian walkways, and sidewalks at-traffic level are located on either side of the lanes to lesson the feel of traffic passing by, and to allow people to safely view the L.A. landscape. The bridge is also designed to transfer car accident impacts to the center of the bridge, away from pedestrians. Other features include planters as safety barrier, and stairs and ramps that offer safe crossing of the bridge. “Everything we are showing is within the budget,” Ocon said, explaining other elements can be added later like a connection to the LA River from the belvederes in the current design. Another green element is a biosphere to clean and reduce the amount of stormwater going into the L.A. River. Historic artifacts from the bridge, like the gateways and arches will be reintegrated into the public spaces. A project advisory group, composed of appointees named by Mayor Villaraigosa and Councilman Jose Huizar, includes Boyle Heights Chamber of Commerce Board President Cesar Armendariz and Boyle Heights Technology Center Ex. Dir. Ozzie Lopez. The majority of the funding for the bridge, totaling $401 million, comes from the Federal Highway Bridge Program, State Prop 1B funds and local matching funds through Measure R and Prop C, according to the city. Models of the three bridges are on display in the lobby of the Public works Building located at 1149 S. Broadway until October 5, 2012. If they care so much about local, why are they using a british firm on design? Why not locAL? I have seen many design’s..these are the last three..out of all three. I like AECOM the best..the others are to buzzy..this one I believe give Boyle Heights m’re class..
Wow, wonderful accomplishment. I am glad that found your blog and read all about new design methods used in making these awesome bridges.